In a recent article in OSV, CARA researcher Melissa Cidade noted a surprising statistic: only 17% of adult Millennial Catholics (those born after 1981) are aware of liturgical changes that will occur at English language Masses on the first Sunday of Advent. Millennials represent about one in five adult Catholics (19%) and the oldest members of this generation were in elementary school when the Internet began to gain widespread use in the United States. They are sometimes described as the digital or new media generation. Many in the Church assume that the way to connect with this emergent generation of Catholics is not through traditional print media, television, or radio but online—through blogs, Facebook, YouTube, and Twitter accessed on smart phones, tablets, and e-readers. The hope is often stated that we may be able to use new media to get this generation “back into the real world pews” that are more often populated by their parents and grandparents. The Catholic Press Association (CPA) of the United States and Canada recently commissioned CARA to conduct a national poll of adult Catholics to measure their media use. CARA partnered with Knowledge Networks to conduct the survey in May and June 2011. The survey was completed by 1,239 self-identified Catholics who were 18 years of age or older (resulting in a sampling margin of error of ±2.8 percentage points). The study also makes comparisons, where possible, to a parallel survey conducted by CARA in November and December 2005 for the United States Conference of Catholic Bishops' Department of Communications regarding Catholic media use. The findings (Download the Full Report) from these studies suggest that the emerging picture for new media use by Catholic adults overall—and especially among the Millennials is not as promising as many hope or assume. The problem is that putting something online is not the same as getting something on someone’s coffee table, front porch, or even in their mailbox. The Internet is a much more vast space and is navigated by search and social network. You can’t force people to consume your content. You likely won’t even get it on their computer screen or iPhone unless they are interested in it and looking for it. 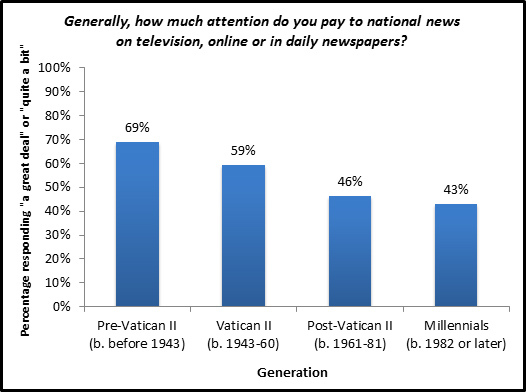 First, the study shows that only a slight majority of Catholics (52%) pay “a great deal” or “quite a bit” of attention to national news (e.g., it is no surprise that many are unaware of the coming liturgical changes). In the new media age, they don’t have to. Thirty years ago many had only over-air television reception with three networks, and local radio and newspapers to choose from. The news was an inescapable part of the broadcast. With the development of cable television, satellite radio, the Internet, e-readers, etc. the content available to most has now expanded exponentially. In this new media environment, many have “narrowcasted” themselves into their interests—whatever these may be—and have largely tuned out the world that is not of their immediate interest. Entertainment has often trumped news, information, or other content when making these choices. Attention to news is lowest among young Catholics. What about use of religious and spiritual content? Is Catholicism a part of adult Catholics’ narrowcasted media interests? The signs from the research suggest that too few Catholics are aware of and using religious new media resources for these to be considered a form of mass media. When it comes to Catholicism, more often than not, traditional media still have a much broader reach in a “new media” age. While 22% of adult Millennial Catholics have read a print copy of their diocesan newspaper in the last three months (compared to 26% of all adult Catholics) only 4% of those in this generation have sought this out and read it online. Despite what conventional wisdom or anecdote may suggest, Millennials do not overwhelmingly prefer reading content online compared to print. A third of these respondents indicate a preference for online content (32%), while another third prefers reading print (33%). Thirty-five percent do not have a preference either way. The study also shows that awareness of national Catholic media has dropped a bit in recent years. The survey respondents were provided a list of 28 national Catholic newspapers and magazines and asked about their awareness and readership of each of these. A majority, 56%, were not aware of any of the publications listed. When presented with this same list in 2005, a minority (46% of respondents), were not aware of any of the publications listed. Overall, adult Catholics are most aware of the following national Catholic publications (i.e., more than 8% or 4.5 million adult Catholics): Catholic Digest (32%), Maryknoll (12%), Liguorian (9%), and Our Sunday Visitor (8%). They were most likely to be aware of these same four publications in 2005. Adult Catholics are most likely to indicate reading the following national publications in print in the last three months: Catholic Digest (9%), Maryknoll (3%), Our Sunday Visitor (2%), and The Family Digest (2%). Seventy percent of Millennials have no awareness of any of the major national print Catholic magazines and newspapers. Only one title, Catholic Digest, garners more than 7 percent awareness among Catholics under 30 and this publication has among the lowest web traffic of any title listed (Catholic Digest’s own tracking by Site Meter estimates globally a total of 423 visitors per day at the time of this post). Of those Catholics who do read religious or spiritual content, most are doing so in print, not online. Catholics are also more likely to watch religious or spiritual video content on television than online and to listen to religious or spiritual audio over the radio or on a CD than in online podcasts. Of the new media offerings, Millennials are generally no more likely (accounting for margin of error) than older Catholics to say they have done anything online or through the use of e-readers related to religion or spiritually. Few Catholics report doing anything with new media that is related to religion and spirituality at all. It’s not that Catholics aren’t online or using new media. They just aren’t using these to do things related to their faith in any great number. The study shows some evidence of younger Catholics going to the Internet for information on parish, diocesan, or school websites (see page 57 of the report). Yet, there is no evidence of widespread use of Catholic blogs, news, or entertainment media. Seventy-one percent of Millennials have a social network profile of some kind (e.g., Facebook, LinkedIn). However, only 43% of those in this youngest generation has one of these profiles and simply indicates that they are Catholic on them (i.e., 60% of those with profiles self-identity as Catholic on the profile). Many of those who are using new media related to their religion and spirituality do not fit the stereotypical image that might first come to mind. The study identifies the typical Catholic who uses Facebook for following religious and spiritual content is not a Millennial at all. It is a non-Hispanic white, divorced, Vatican II Generation (age 51 to 68), woman, living in a home in the Midwest, with an income between $85,000 and $99,999 a year. More troublesome for the future of Catholic new media is evidence of an apparent drop in interest in anything Catholic online in recent years. We have commented on this elsewhere and provided a new permanent tracking feature at the bottom of this blog. While U.S. Google search volumes for anything regarding religion and spirituality have remained relatively steady since 2004, there is a noticeable drop in search volume for anything containing the word Catholic that departs from the religion and spirituality trend beginning in 2007 and worsening since. The news on YouTube is not much better. For example, the Vatican has created a channel that regularly includes videos of Pope Benedict XVI. At this time more than 33,700 subscribe and more than 5.7 million views of videos on the channel have been made. Even with this reach the Vatican’s channel ranks #3,562 on YouTube in video’s viewed globally (the U.S. traffic rank for the vatican.va website is a bit higher at #2,361). The single most viewed video on the Vatican’s channel was posted in January 2009 and includes images of Vatican Communications with background music. It has more than 100,000 views and is 1.36 minutes in length. The current discourse surrounding Catholic new media is often very rosy and optimistic. The data just do not match this conversation—yet. Traditional media sources continue to be more often used and preferred by Catholics for religious and spiritual content. The survey’s respondents were asked in an open-ended question, “How would you feel if print versions of Catholic newspapers and magazines—including your diocesan newspaper or magazine—ceased publication and moved their operations entirely online?” Only 18% of those responding to the question provided a response that included a comment that was positive about this hypothetical proposition. Most either expressed a negative opinion (39%) or a neutral or mixed opinion (39%). Four percent provided a comment that could not be coded as positive, negative, neutral, or mixed. Negative comments often referenced a personal preference for print versus online content or a concern that others—especially the elderly and poor—would be unable to gain access to an online-only publication. Positive and mixed comments often cited an online publication as being more environmentally friendly and cheaper for dioceses to produce. Although Millennial Catholics are using new media frequently, they have yet to use it for religion and spirituality in any great number. Will they ever? How can this be achieved? Those are unanswered and difficult questions for now. But what can be concluded is that creating content for new media does not mean people will use it. The era of broadcasting is over. In a narrowcasted world, people have to be aware of and want to visit and use your content. Right now not enough Catholics seem interested or aware. Is it the content? Is it the crowded media environment? Is it a culture consumed by pop media and entertainment? Is it secularization? This study generated just as many questions as it did answers. New media will require new research and a new understanding. Q: Only 26% of adult Catholics regularly read a diocesan newspaper or magazine? That is disappointing. A: Sure it would be great if those numbers were higher (note that 55% of weekly Mass attenders regularly read) but this number is also equivalent to 14.8 million adults, which represent about 5 percent of the total U.S. population. That means 1 in 20 Americans regularly read these publications. If diocesan newspapers and magazines were a television show they would be in the top 10 of the Nielsen Ratings in terms of people reached. Diocesan publications collectively also have a broader reach than the circulation of any magazine not printed by American Association of Retired Persons (The AARP Bulletin circulates at more than 23 million copies). Also, unlike secular newspapers and magazines that are experiencing rapid declines in circulation and readership, use of print copies of diocesan newspapers and magazines has been stable during the 2005 to 2011 period. Q: I never see young people reading print publications. There is always a device in their hands accessing and posting things online. A: But how often are they doing something related to their religion on those devices? The study indicates that this is not happening often or in great numbers. 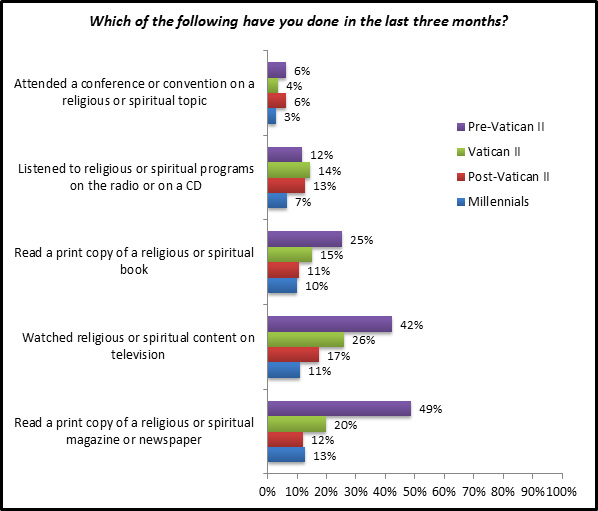 Also, when young people are looking for news and information about their religion or about what is going on in their diocese the study indicates this is still being done most often using traditional media. Q: There never has been a major Catholic presence in American media. Why would you assume there should be one now? A: You may recall that first on radio and then on television The Most Rev. Fulton Sheen was an unprecedented media superstar in his time (and still reaches many today in recordings). His television lectures, for which he won an Emmy, regularly competed against Milton Berle and Frank Sinatra on network television and often came out on top in ratings. At its height, his show was watched by more than 30 million people. Will there ever be someone like him again that can pull in that audience in the narrowcasted media environment today? A: In our 2005 study, 9% of adult Catholics indicated that they have watched EWTN at least once in the six months prior to being surveyed (this question was not replicated in the 2011 study). The programming this channel provides (over television, radio, and online) is a big part of the U.S. Catholic media presence and EWTN is obviously a very successful media organization. However, estimates for ratings are difficult to find and its content does not likely compete well with other network or cable programming on the national level. EWTN more often speaks to the number of homes (and countries) its programming can reach rather than specific numbers of viewers, listeners, or readers. A: For years, if you searched for “Catholic” online this would be the first website in your results and one of the sites with the most traffic. Its continued presence in this position generates many visits and views and you can see the estimated analytics for the site from both Google, and Quantcast. These appear to track between 20,000 to 60,000 visitors per day from the United States to the website (Note: catholic.org's internal tracking registers a higher number of visitors). This is one of the most successful Catholic websites on the Internet. But the volume of traffic to the site is not yet in the “major” media presence range. However, given its placement in search results catholic.org is likely the most valuable Catholic-themed real estate in cyberspace other than vatican.va. Q: What about _____________'s blog? A: There certainly is no shortage of very successful Catholic blogs with significant followings (e.g., Whispers in the Loggia, OSV Daily Take, Fallible Blogma, USCCB Media Blog, The Gospel in the Digital Age, American Papist, In All Things, Googling God, PrayTell, U.S. Catholic Blog, The Deacon's Bench, Dating God, Catholic Culture, American Catholic... ). But these typically do not reach audiences to where they would be considered mass media. 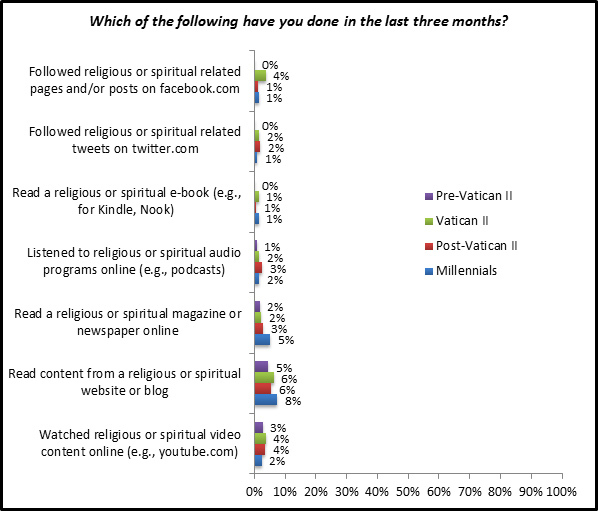 The survey results indicate that only 6% of Catholic adults (and 8% of Millennials) read a religious or spiritual blog in the three months prior to being surveyed. More so this 6% likely represents a great variety of different blogs. Pro-Life America: Is this a Spaghetti Western? Could Parishes Fill the Social Welfare Gap?